Lush Fab Glam Inspired Lifestyle For The Modern Woman: Batkid Begins: One Child, One Wish, Millions Given Hope. Batkid Begins: One Child, One Wish, Millions Given Hope. Most kids get to read about, watch TV shows and movies about or dress up as their favorite superhero for costume or birthday parties, but one incredibly lucky boy had his wish come true. When he not only became Batkid for a day but won over the hearts of the city of San Francisco and America as we followed his spectacular journey! Batkid Begins is an exciting new documentary directed by independent filmmaker Dana Nachman, which tells the story of how Miles Scott’s one wish came to fruition and why it resonated with so many people around the world. On November 15, 2013, San Francisco was transformed into “Gotham City” for one very special 5-year-old boy named Miles Scott, who had fought leukemia (and won!). Miles had one wish: to be Batkid, but no one could anticipate how many millions of hearts he’d capture when that wish became reality thanks to thousands of volunteers supporting Make-A-Wish Greater Bay Area. Make-A-Wish Greater Bay Area grants more than 300 wishes annually to children who have battled a life-threatening illness. And to grant Mile's his wish more than a billion people including President Obama and astronauts from the International Space Station took to social media to cheer on Batkid. In fact the #SFBatKid and #BatKid hashtags reached more than 1.84 billion people on Twitter and Instagram. Talk about going viral and what better reason than for such an amazing cause! It was absolutely amazing to watch it trend on twitter, join along in the conversation and to see it featured in the news. Even more fascinating was watching people from all walks of life come together to rally around a little boy whose name they were hearing for the first time but who touched all of our hearts. The 'Batkid Begins' documentary focuses on the “why” and the “how” of this amazing event. Why were so many people moved to make one little boy’s wish come true. And how did Make-A-Wish Greater Bay Area pull it off? "Can’t get enough of Batkid? 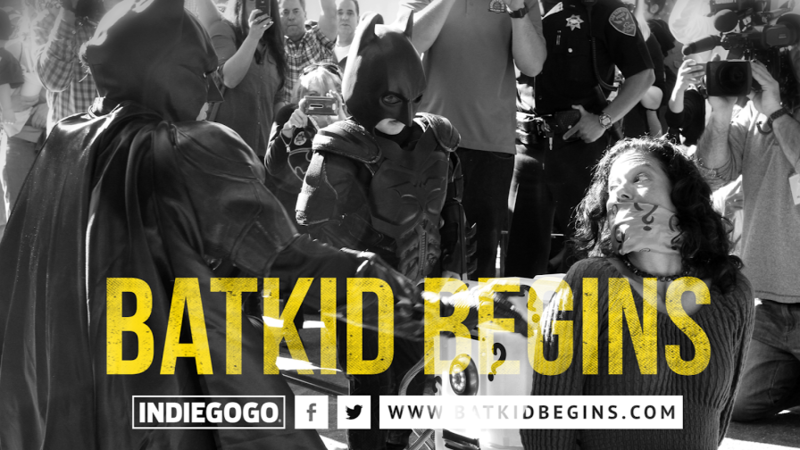 Lend your support and learn more about the exciting new Batkid Begins documentary here." Why should you watch this documentary? To see and be touched by Mile's incredible story as he morphs into Batkid with the added bonus that all proceeds from the Batkid Begins documentary will benefit San Francisco charities like Make-A-Wish Greater Bay Area. Want to see your name in the Batkid Begins Film credits? Then support the Batkid Begins IndieGogo campaign with donations starting at just $5! To make Batkid Begins worthy of its superhero namesake, KTF Films is teaming up with big-name musicians, animators, and visual effects professionals, all working at reduced rates in the name of Batkid, and bringing the post-production price tag to $100,000. Plus there are awesome rewards for showing your support (see below)! A social media shout out on Facebook or Twitter. Batkid swag (capes, mugs, t-shirts and more). An original print of one of Batkid's artistic drawings. Tickets to the San Francisco screening of the film with cast & crew. Or a private home screening for you and 20 friends! The IndieGogo campaign will end on August 19, 2014 at 11:59pm PT. Click here to show your support. Did you see Miles' incredible Batkid story in the news or on social media and will you be watching the documentary? Share with us by leaving a comment below.